Form: Densely branched tree with rounded outline. Use: One of few yellow flowering trees. A good choice for limited space. Notable Characteristics: Medium to fast grower, Yellow foot long flower panicles in July, bright green leaves, golden yellow-orange fall foliage. Where can I find this tree in Glen Ridge? Unknown. 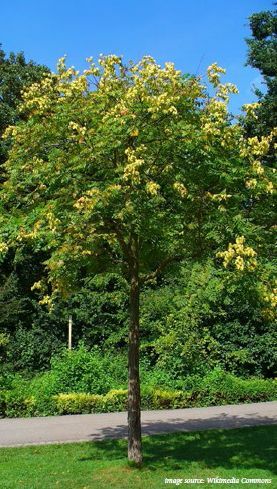 Golden Raintree was not identified on the 2013 tree inventory.